June 2015 - After a 2 month hiatus, we’re back as we begin a new chapter, actually more like a new "book" in our lives. We so throughly enjoyed the RV life last winter that we decided to try this full time. Our house sold right away, no turning back now. We sold and packed up our house in less than 2 months, it was grueling, so many years of accumulating "stuff". So our new book begins….we dedicate this blog to my mom and our kids. They are all an adventurous lot and have supported us with much enthusiasm. We dearly love them all. Before leaving the dairy state, we spent a couple nights parked at the home farm where my sister and brother-in-law live. It was very special staying there, many wonderful memories. And the "camp hosts" were the best! We got a text in the morning when coffee was ready. My sister takes after my mom, she's the Betty Crocker of the family and treated us to a couple great dinners. Our first stop in Sioux Falls, SD. We loved this beautiful park with the cascading waterfalls (Sioux Falls). 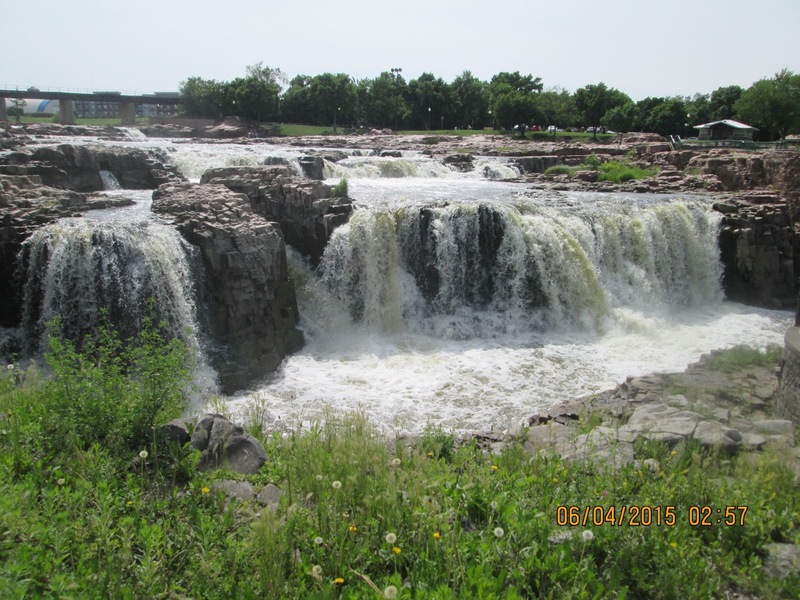 We followed the river walk to downtown, and took a short trolly ride with a narrative history of Sioux Falls. Beautiful downtown. We enjoyed the many sculptures downtown. This was my favorite. The picture doesn't do it justice, the little boy is holding an ice cream cone and has ice cream on his face. 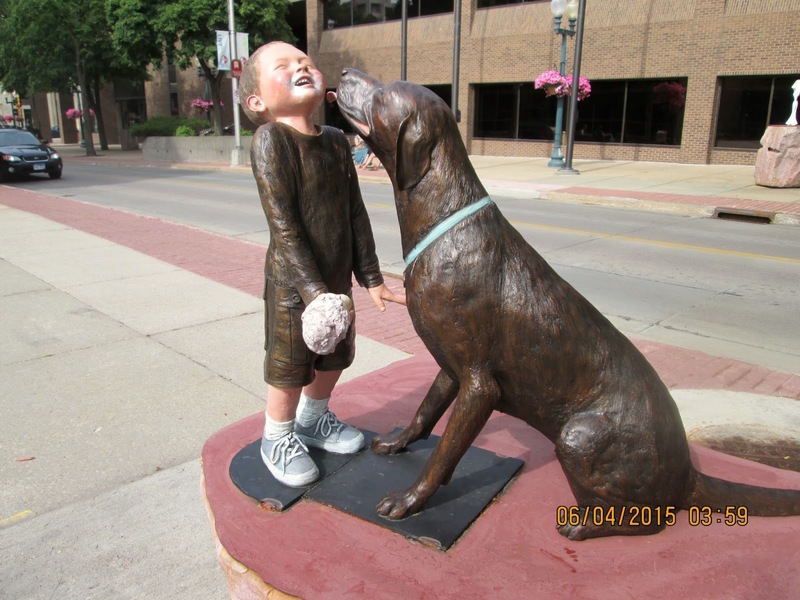 Another stop on our way to AZ was in Hutchinson Kansas. Two of my hubby’s sisters from Dallas met us there for an evening together and dinner. While there we learned of an Underground Salt Mine and Museum, we decided to check it out. The trip down into the mine was on a double-decker industrial elevator, the mine/salt deposit is 650 feet below ground. We were amazed at the huge underground area that has been mined out, the tunnels are wide and clean. Even though the area we toured was not being mined it was easy to see all the salt in the walls. There are over 150 miles of tunnels under this city. The mine continues to be worked in another area. One of their largest customers is the city of Chicago, the salt used for winter roads. As well as self guided exhibits there is also a tram that goes into mined areas where we saw artifacts left behind by miners over a period of 85 years. Our guide told us what goes down into the mine stays there. We saw a couple old tractors that were hauled down in pieces and reassembled. Miners only took parts down that were necessary for operation, things like fenders not necessary. Of all things, I particulary liked the bathrooms, the walls are the original salt walls as in the mine, the bathrooms were well lit and the walls sparkled. These bathrooms were built for the museum and are very modern. The miners didn't have it so nice. A huge chunk of salt on display. 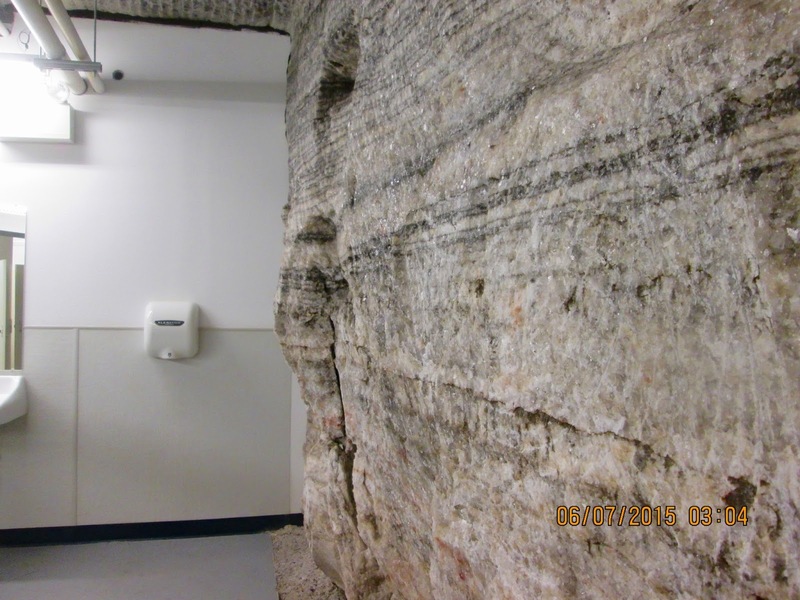 Another very interesting facet of this mine....Underground Vault and Storage, a Hutchinson company has built a thriving business in the mined-out sections of the salt mine. The caverns, accessible only by a rumbling mine elevator, are safely beyond the reach of tornadoes and far from any known earthquake fault. Temperature and humidity stay at near ideal conditions for preserving paper and film brought here from around the world. This display replicates the storage facility that is off limits to visitors. There is a separate elevator to reach the storage area, only people with high security clearance can enter. Warner brothers and Sony Pictures are a couple of their largest customers as well as the U.S. government. The SuperMan suit is an original from a Superman Movie, it's encased in glass in the museum area. The film cases are staged to depict the storage area. Some interesting things stored here are the original film negative for "The Wizard of Oz." A collection of New York newspapers dating to the assassination of President Lincoln. Secret U.S. government documents. Thousands of medical research biopsies encased in wax. And much more buried 650 feet beneath the Kansas prairie in a vast underground salt mine warehouse. The storage facility covers over 40 acres. Who would've known?? We were amazed. When the day ends, we thank God for blessing us with this opportunity.